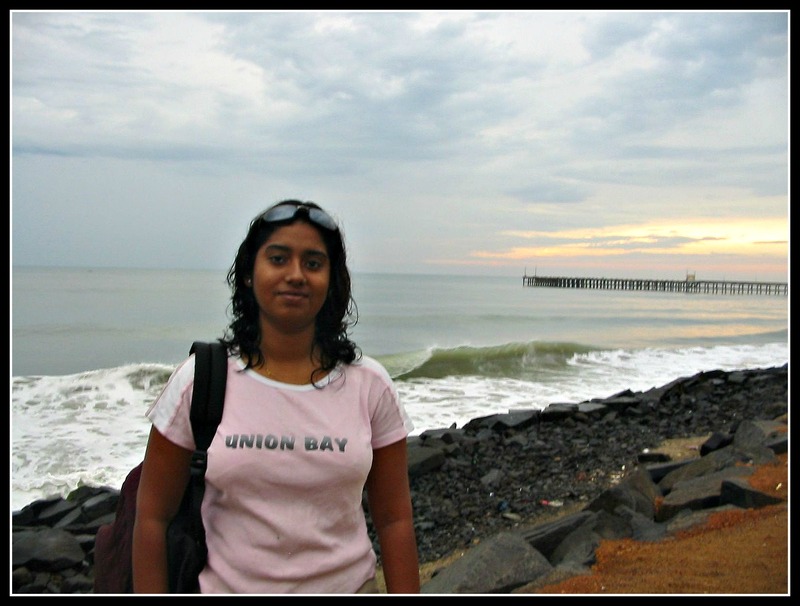 This pondicherry trip was my first solo adventure that I got into inadvertently and oh..boy, it couldn’t have turned better than it did. It was a long weekend. With an intention to persuade my family to come on an unplanned holiday with me, I threatened them that I would go alone if they didn’t come. They totally believed I would not go for I was the kid who cried in the middle of the street for candy only to run behind my mom as soon as she turns the other way. So….they let me go alone. I was totally terrified and hoped someone would stop me. But no one did. My dad even offered to drop me to the closest bus stand. Since no one was stopping me, I had to take up that offer and head to the bus stand and off to Pondicherry, the nearby coastal town from Chennai. So that’s how I ended up in Pondicherry, one afternoon after a three hour long journey in the bus from Chennai. After a late lunch near the bus stand, I started hunting for a hotel room, only to find out that the whole world seem to be celebrating their long weekend in Pondicherry . After a series of unsuccessful check ins, in a number of hotels in person and over phone, I spent a couple of hours brooding over my predicament in the promenade of the beach. The nice gentleman in the tourism office who helped me pick up and inquire a few hotels that he considered safe for me, told me as nicely as possible that I was crazy or stupid or both. After a small stroll in the rocky beach and the jetty, and more specifically to ward off someone stalking, I went in to check with the Park Guest House. Park Guest House belongs to the Aurobindo Ashram, and is one of the most coveted places to stay in Pondicherry where you can consider yourself lucky to find a room during middle of the week. Park Guest House is the only property that is right next to the beach as it is in the dead end of the beach road. All other costlier and private resorts are also only in the other side of the road. It was no surprise to see a huge board that said ‘House Full – sorry guests we’re full’ outside the gate. The watchman reiterated the message to me and said no rooms are available. I persuaded to him to let me go inside and check. The receptionist confirmed these statements to me and said there are no rooms available. I was sad and dejected, though not surprised, and was walking back to the door; suddenly the guy in the reception called me back and asked me what the purpose of my visit was. I said ‘Holiday’. (I later found out that only acceptable answer for this question was ‘to visit Ashram’). He then asked me have you stayed in the guest house before and I said no (I found the more acceptable answer here is yes, as they have strict rules and regulation which new people sometime resist.) He stared at me for a second and said “I have a room at the back, no view and it costs Rs.100/day. You should pay the entire amount in advance.” I had to pinch myself..whhew..I’m awake and not day dreaming. I filled in the details and paid the entire amount of Rs.100 (:P) in advance. My luggage which was just a bag, was picked up by an attendant and I was shown the room. The attendant who accompanied me told me that this was the only room vacant in the entire guest house and I was extremely lucky to have it. I enthusiastically agreed with him. I went inside and jumped out of joy in the room at the serendipitous circumstances that lead me there!! It was a Sunday, so I went out to window shop in the Sunday Market to pick some essentials I had forgotten to pack with me and also to withdraw some cash from ATM. I then spent a few glorious hours in the beach listening to the roar of the oceans. I got back by the Park Guest House’s in time of 10 PM and spent a few more hours in the resplendent moonlight inside the guesthouse’s park overlooking the beach. It was a blissful evening!! Life just couldn't have been better. The next day with the aid of a map, which I could read very little, (John Gray was quite right about women not being able to read maps) and a hired vehicle, where my skills were far better than my map reading abilities I explored Pondicherry. Earlier in the day, I visited the Ashram, the famous Ganesh temple and had a good darshan in both places with a peaceful meditation in the ashram. With some guidance and misguidance, my first stop was at Chunnamar Boat House. 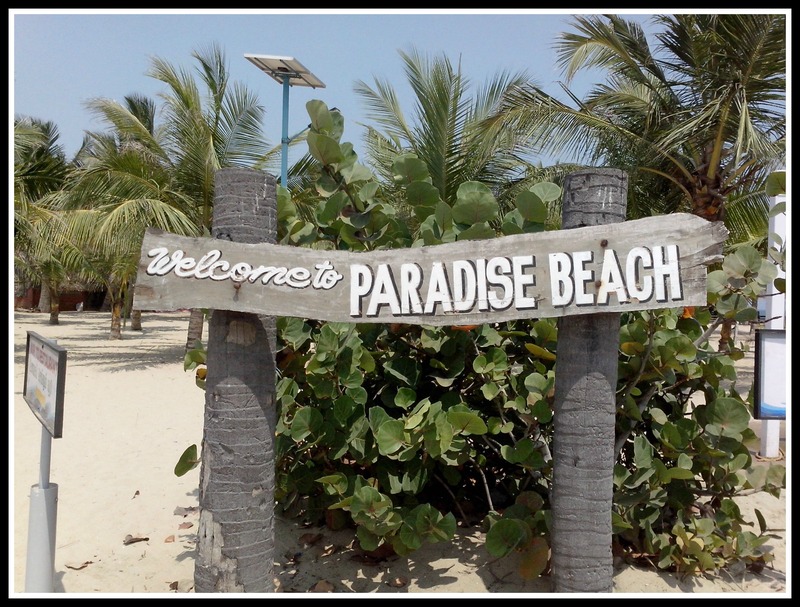 A wonderful motor boat ride from the boat house took me to a beautiful island called the Paradise Beach. I spent more than an hour in the paradise beach playing in the water, sand, swing and taking some selfies. It was a nice boat ride and had become quite well versed in taking my own photos with my camera. Those were the days selfie was not part of the dictionary or practice. I also requested some respectable strangers for a few long shots. Post my paradise outing, I found myself in the company of two men who were equally lost and even more so as they were unable to speak tamil. So I acted as the translator and found our way back to the city for all three of us. They requested me if they can have lunch with me, since I didn’t own the restaurant I had to agree : P. It was first experience of having long conversations with fellow travelers and having lunch with people I had just met. A feat I had often repeated in my later endeavours and hardly ever regretted. I was back in my room, and had to take a break from the scorching sun. In the evening, post nap, I went to Auro beach, a beautiful little non touristy less crowded beach where I could spend some more time doing the same set of activities of playing in the sand and water. As soon as I got back, I handed over the bike to the rental shop and went for a walk in a park opposite to the Raj Bhavan or Governor’s Palace. I could not go to Auroville as it was closed for the government holiday, the day being Gandhi Jayanti. It was a long tiring day, when I walked a lot, and attempted many things out of my comfort zone which also caused me to be extremely happy. It rained that day, and I went to bed early listening to the sound of rain outside. It was almost like meditation. All good things come to end, and it was time to say bye, pack up and leave. After a sumptuous breakfast in a beachside table in the guest house, I packed and got an auto to take me to the few places I had missed out on the previous days like Auroville matri mandir. The auto dropped me in the bust station after my short site seeing tour and there I stood waiting for the bus after a heavy lunch and with a heavier but happier heart, heading home until the next adventure. It was my first solo trip, and hence was a very special trip for me. A trip that later gave me the courage to take many more, believe in the fortuitous events that are almost always good, to plan less and trust more. It showed me what it means to be a traveler rather than a tourist. It taught me what experiencing a place meant over seeing a place and it taught me that travel is not just a journey to discover the world outside but mostly a journey to discover the inside of yourself. For those religiously inclined, Pondicherry is a place where you can a lot of Siddha Temples/Samadhis which are considered very potent. I also enjoyed my visit to a very ancient 500+ year old Siva Temple called Vedapureswarar Temple, which gave pondicherry its older name of vedapuri. Pondicherry has also some really old and beautiful churches built in the colonial era that have stood the test of time, including Our Lady of Immaculate conception, Egilse de Sacre Coeur de Jesus or Church of the Sacred Heart of Jesus. 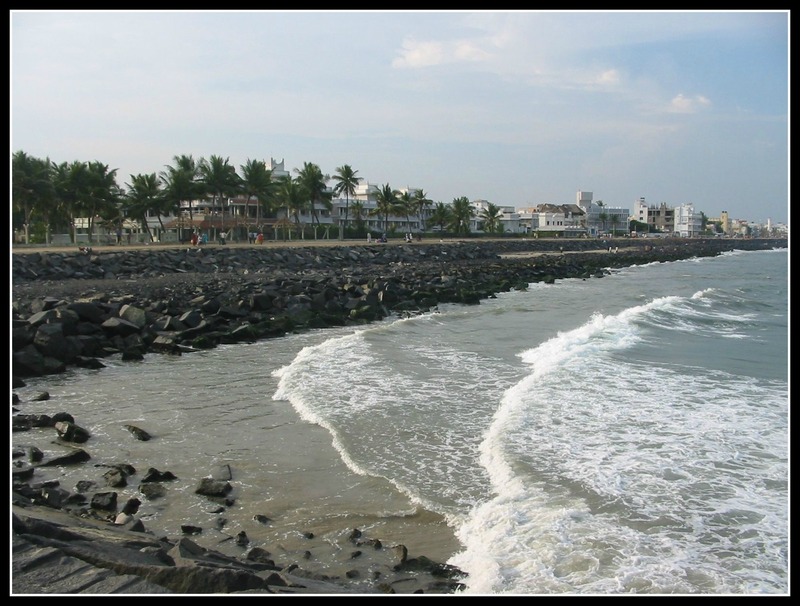 I would really recommend the walking tour of pondicherry where you can explore the French and Indian sides of Pondicherry that would help you appreciate the different architecture, the two varied sides and how well they co-existed. Ashram also has some more exciting places like the paper factory where handmade papers are made and craft items are sold. Dining/Group Meditation: A lunch or dinner in the common dining room and group meditation sessions are unique experiences worth trying. Shopping: Sunday Flea Market is a great place to buy anything and everything and bargaining is a must. 1) Summers can be really hot and if you plan to be there around then (Mar – Jun), do not plan much activities in the day or at least plan for afternoon siestas. 3) Sunday markets can be found in M.G Road and are a great place to buy good and cheap western wear and craft items. 50% of the quoted price is often a good place to start. Don’t be afraid of passing up and walking, if the price was agreeable the vendor will mostly call you back and give it to you at the price you quoted. 4) I had always been told to book the guest houses and online and I never found a proper working system for booking the guest houses. If you found one, please let me know. 1) True to the tag line of Give Time a break, Pondicherry is typically a place to be laid back rather than have a list of things to do. 2) Be careful to examine the quality of things you buy at the Sunday Flea Market before you strike the deal. 3) Staffs at the Ashram guest houses and shops are often rude to guests and I have never found out why. But it would do you good not to expect the ashram guest houses or shops to be polite either because it’s a spiritual place or because you are customers.